William E. Thomson, Jr., Esq President Mr. Thomson is a partner with the Intellectual Property firm of Brooks Kushman in Los Angeles. He was formerly a mayor and council member of the City of Pasadena. William F. Kruse, Esq Vice President Mr. Kruse, the Managing Partner of Lagerlof, Senecal, Gosney & Kruse, LLP is also active with the local United Way. Joan J. Branin, PhD Treasurer Ms. Branin retired as Professor of Health Services Management & Gerontology and the Director of the Center for Health & Aging at the University of La Verne. She is also involved with Questers El Molino. Charles G. Stanislawski, MBT, CPA Second Treasurer Mr. Stanislawski is the president and CEO of Stanislawski & Co., Inc., a tax, accounting, and consulting firm based in South Pasadena. Karen Craig Secretary Mrs. Craig is a retired banker, and now works extensively as a Museum volunteer. She is also involved with other local nonprofits including Questers El Molino. Janet Kadin Volunteer Council Representative Mrs. Kadin is a long-time Museum and community volunteer; she also serves as PMH’s Volunteer Council President. Jeff J. Abbott Mr. Abbott is the Facility Manager for Emser Tile and is formally the Facility Manager for Avery Dennison’s global headquarters. He is also involved with Habitat for Humanity. Stephen Acker, Esq Mr. Acker is a shareholder at the firm of Acker & Whipple, chair of the Law Practice Management Committee of Defense Research Institute, and a member of the American Board of Trial Advocates. He has served on Pasadena City Council. Charles Adams, III Mr. Adams is Senior Vice President of Whittier Trust's Real Estate Department. Sally Bixby Ms. Bixby is a past President of the Pasadena Tournament of Roses. She retired as the director of surgical services for two local hospitals. Leonardo Bolanos, CTFA Mr. Bolanos is the Vice President and Banking Relationship Advisor of Northern Trust. He also serves on the board of directors with Extraordinary Families and the Los Angeles Estate Planning Council. Linda Davis-O’Leary Ms. Davis-O’Leary is the Vice President of Western Systems Research, a manufacturer of diagnostic equipment. She was a co-producer for the Hollywood Fringe Theater Group and sponsors local professional pianists. Joshua R. Driskell, JD, MBA Mr. Driskell is Managing Partner of Primuth, Driskell & Terzian, LLP specializing in tax, trust, and business law. He is also on the board of Leadership Pasadena and the Pasadena Fire Fighter’s Foundation. Wendy Funkhouser Ms. Funkhouser is an independent business consultant based in La Canada. Julie Gallant Ms. Gallant retired as Senior Investment Manager for the Pasadena region of Wells Fargo Private Bank. 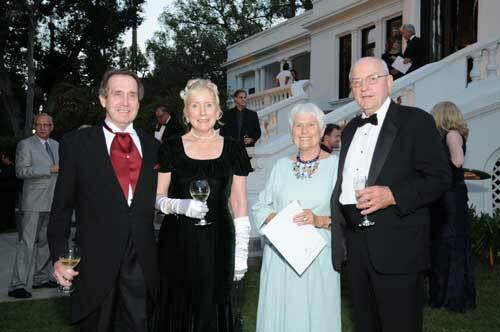 She also serves as a member of the Pasadena City College Foundation Board and Advisory Board. Jennifer Lorenzen, CPA MST Ms. Lorenzen is a Tax Manager at Lorenzo & Noll, CPAs. She is the Treasurer of the Estate Planning Council of San Gabriel Valley. Elizabeth A. Smalley, MD Dr. Smalley is a physician and partner at Health Care Partners in Duarte. Jeannette O’Malley Ms. O’Malley has served as the Executive Director of Pasadena Museum of History since 2000. Image: Dennis O'Leary, Trustee Linda Davis-O'Leary, Nancy McIntyre, and Board Secretary Don McIntyre at 2012 History Makers Gala. Photo by Jim Staub.